John Wesley Dean III was a White House Counsel to United States President Richard Nixon from July 1970 until April 1973. 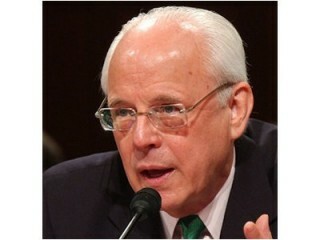 John Dean was legal counsel to U.S. president Richard Nixon during the Watergate scandal of the early 1970s, and his testimony before Senate investigators convinced many Americans that Nixon was closely involved in the criminal activities that eventually led to his resignation from the presidency. Dean started his legal career in Washington in the late 1960s, as the chief minority counsel for the House Judiciary Committee. He then served as an associate deputy in the Attorney General's office before being appointed as White House counsel. In his testimony before the Senate committee, Dean claimed Nixon knew about the 1972 break-in at the national headquarters of the Democratic National Committee and had helped to cover it up. Dean's supporters saw him as courageous and truthful; his detractors saw him as self-serving and disloyal. The law saw him as guilty of obstruction of justice, and Dean was sentenced to four months in prison for his role in the scandal (he spent the four months under a "witness protection" program). Dean went on to write books about his experiences in the Nixon White House, including Blind Ambition (1976), which became a made-for-TV movie. Since then he has worked as an investment banker in California and written columns, essays and books on subjects as varied as president Warren G. Harding and Supreme Court justice William Rehnquist. In 2004 he emerged as an outspoken critic of the administration of George W. Bush and published the book Worse Than Watergate: The Secret Presidency of George W. Bush. View the full website biography of John Dean.